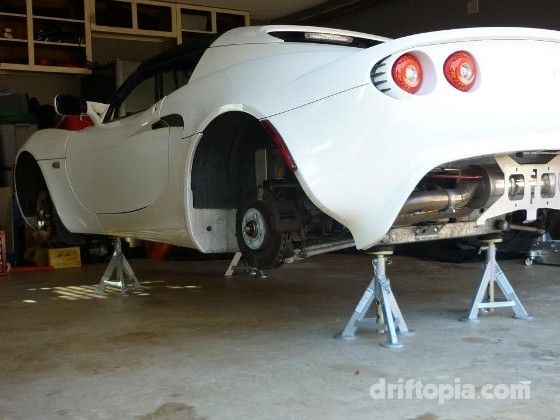 Changing the oil in the Lotus Elise is a relatively simple proceedure but first you will have to remove the rear undertray. Also, you can skip to the bottom for my recommendations on oil type and change intervals. Note: It has been a while since my Elise had the stock oil pan so the drain plug could be 12mm, 13mm or 14mm. 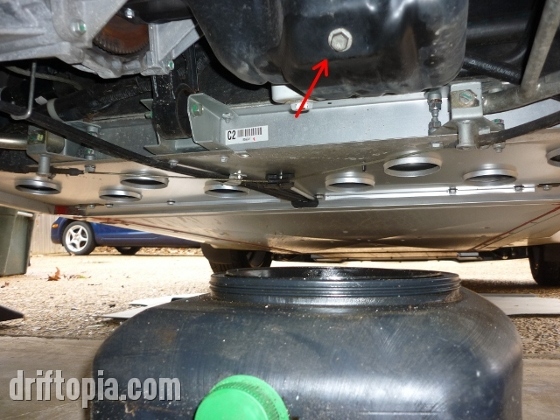 A lot of people place the rear on ramps before draining the oil. I do not do this. Instead I leave the car parked on level ground to ensure that as much of the old oil can drain from the oil pan as possible. Also, it is recommended that you change the oil of a warm motor. What that means is make sure you get the engine oil up to operating temperature before you start the oil change process. This will allow the oil to drain easier. Park the car on level ground with the ignition in the off position. 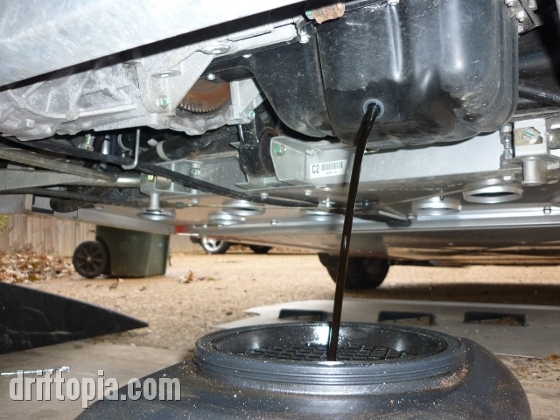 Once you have the undertray off, place the oil drain pan under the oil drain plug. (You can place the cardboard under the oil drain pan at this point. It will catch any oil spillage and make cleanup much easier.) Use the 12mm wrench and remove the drain plug. Let the oil drain into the drain pan. 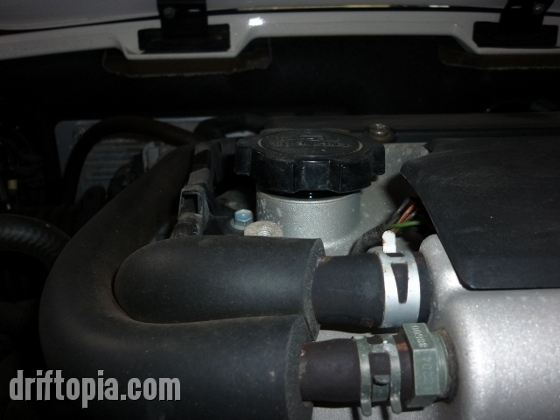 You can speed up the drain rate by loosening the oil cap on the top of the engine. This is the stock oil pan on the Lotus Elise. Note the oil comes out in a slight arc at first. Keep this in mind when placing the drain pan. The oil cap of the Lotus Elise. Once the oil has drained to a slow drip, inspect and clean the threads on the drain plug with a shop towel and then thread it back into the oil pan. Hand tighten the plug and then give it another 1/2 turn with the wrench. 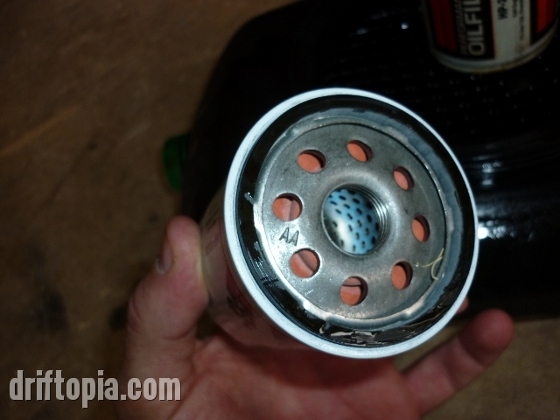 Now place the drain pan under the oil filter and remove the filter with a filter wrench. (Note: You should technically be able to remove the filter by hand but if you have ever let a shop change your oil it will be over tightened. If you are having an especially difficult time with it you can drive a screw driver through the old filter towards the bottom for more leverage.) With the old filter removed, lightly oil the seal on the new filter and hand tighten it to the block. Now tighten it an additional 1/2 turn with the wrench, or the socket if you are using the K&N filter. 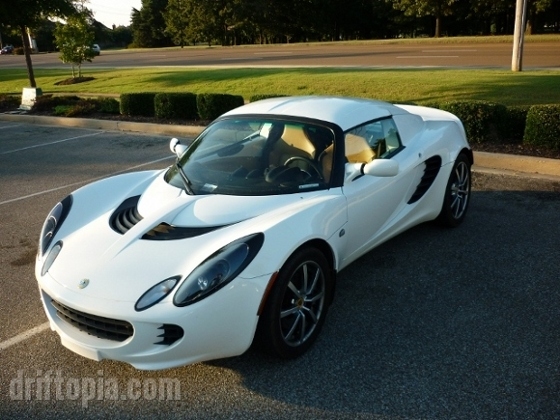 Note: If you haven’t performed the oil line recall of your Lotus Elise, make sure to inspect the oil cooler lines and fittings on the sandwich adapter plate for signs of oil leakage at every oil change. 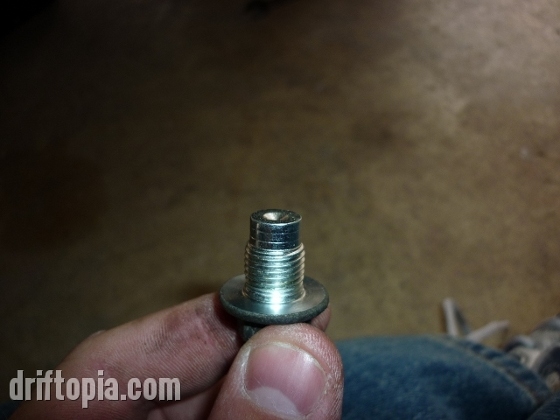 Make sure the threads on the oil drain plug are clean before reinstalling the plug into the oil pan. The oil filter is located right next to the oil pan on the firewall side of the engine. 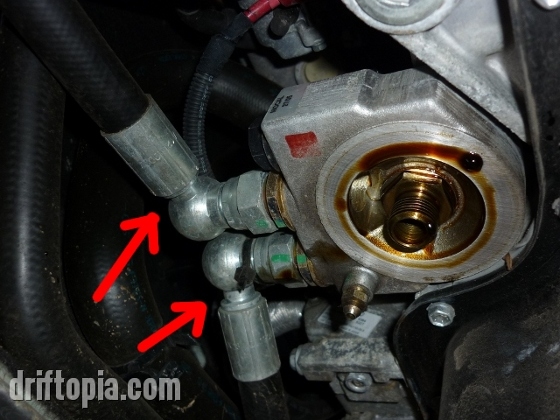 Make sure to inspect the oil cooler fittings and lines for leaks before installing the new oil filter. 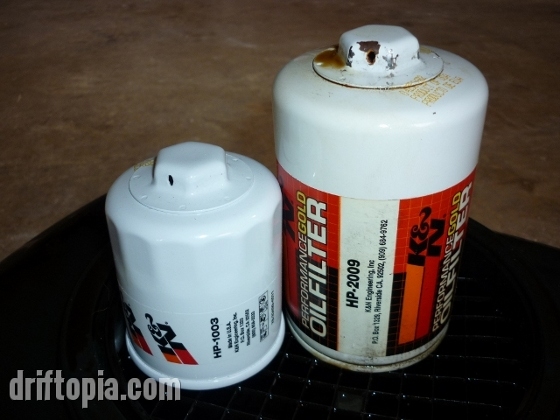 Old filter (HP2009 right) next to the new filter (HP1003 left). Either will work on the Elise with the HP2009 having a larger capacity. 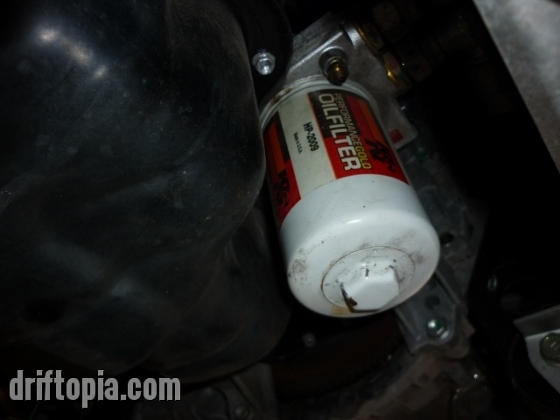 However, the HP1003 is what your local auto parts store will list as the replacement oil filter for the Elise. Lightly oil the rubber o-ring on the new oil filter. This will ensure a proper seal. With the new filter in place and the drain plug secured, begin to add oil to the engine through the oil cap using the funnel. Add the first three quarts and then check the dipstick to see where you are at. 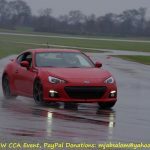 Be sure to wipe the dipstick each time you place it back in. Continue adding the fourth quart until the oil level on the dipstick is between the two level indication dimples. Note: It usually takes around 3.5 to 3.8 quarts to get a proper fill level. 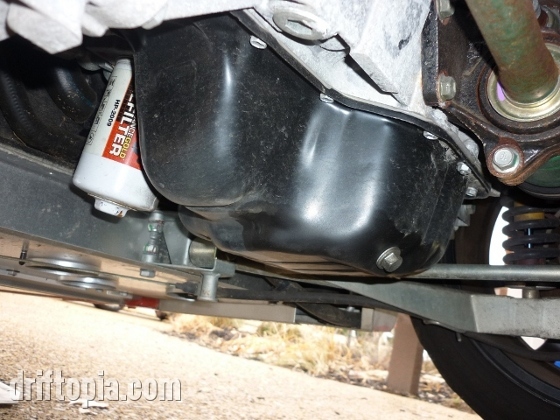 Also, if you have an aftermarket baffled oil pan it will take you up to six quarts. 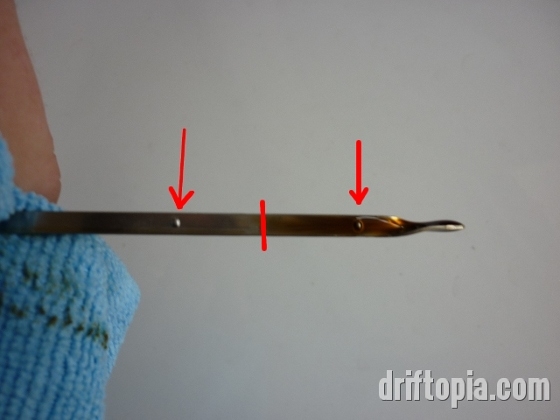 The oil level dipstick in the Lotus Elise. Note the two dimples on the dipstick used to indicate the oil level. The red line marks where my oil level was after filling. Before starting the car remove the oil pan and anything else out from under the car. 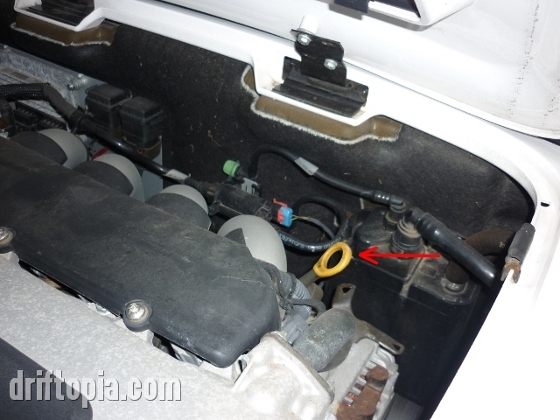 Then check that the oil filter and drain plug are tight and reinstall the dipstick and oil cap. Start the car and verify that your oil pressure light turns off after starting. 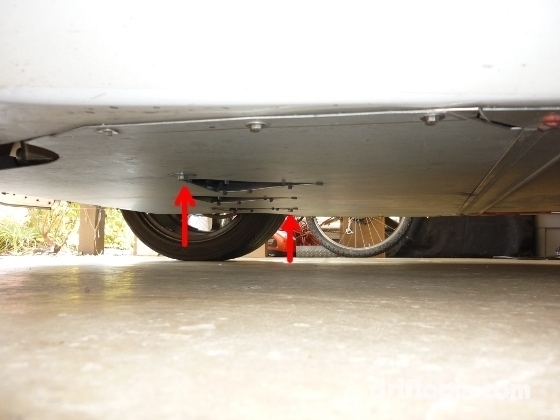 With the car running, take a look under the car and verify that there are no drips. Next, shut off the car and verify the oil level on the dipstick one last time. If necessary, add a little more oil. If everything checks out you are done and go ahead and reinstall the rear undertray. I just wanted to take a second to mention a few things. There has been a lot of debate in the Lotus community about which fluids are best in the Lotus with a lot of guys opting to use oils that are $12+ a quart. This is unneccesary. 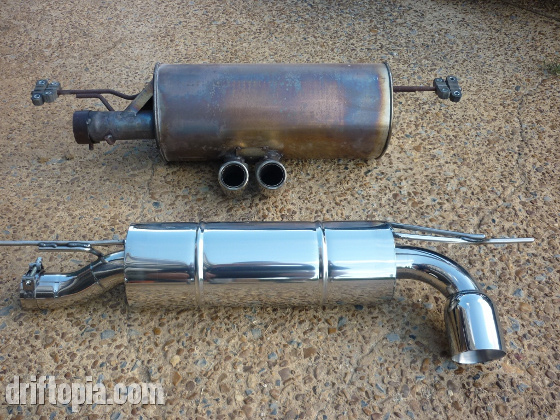 Just choose a good quality and readily availible synthetic like Mobil 1 and you will be fine. I personally use Mobil 1 15w-50 motorsport which runs about $7.99 a quart. Another contested subject is the oil change interval There are some who change their oil every 1000 miles. In my opinion this is a waste of oil. I would recommend changing the oil every 3000 miles if you track the car and every 5000 miles if you just street drive. Or to put it another way, the Lotus Elise is powered by a Toyota engine and does not require Lamborghini levels of attention.